Though St. Patrick’s Day is a religious celebration, enjoying a drink has long been a part of that celebration. And while it’s customary to have a beer or cocktail on St Patrick’s Day, enjoying a glass of wine is certainly an option. To put together a food and wine pairing piece, I asked an Irish friend what she would eat on St Patrick’s Day. 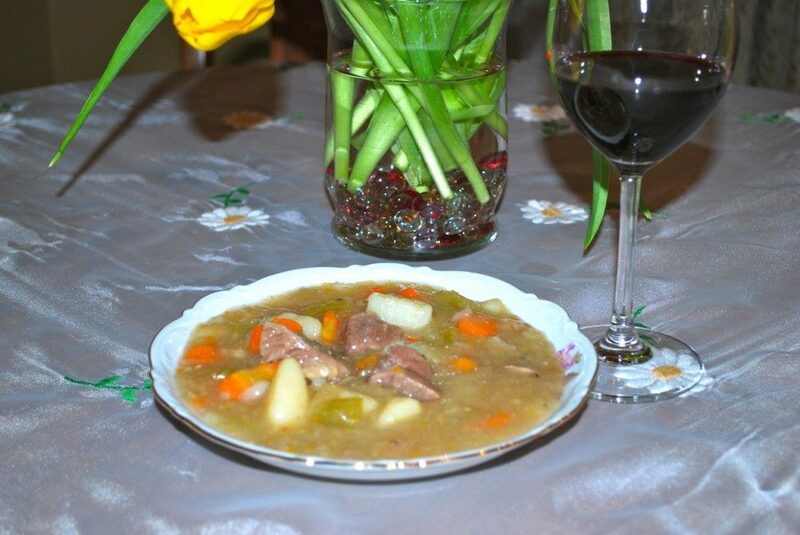 With Irish Eyes Smiling, she said “Mum would fix corned beef and cabbage, Irish lamb stew, and bread pudding.” I took Mum’s menu, and went to pairing wines perfect for Irish food and St Patrick’s Day. Since I didn’t have Mum here to cook for me, and I was short on time to create the dishes myself, I went over to Oshea’s Irish Pub on Clematis Street in West Palm Beach. It’s been recommended for it’s food before, and it’s menu was just what I was looking for. I picked up two main dishes, as they didn’t have bread pudding, and scurried home. The food was still hot when we plated it, which wasn’t surprising since I live only 2 miles away. We started with the corned beef and cabbage. The briny flavors of the corned beef and cabbage worked very nicely with the German wine I selected. 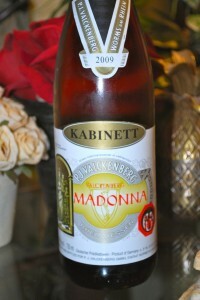 I wanted one with a little sweetness, and the Valckenberg Madonna Kabinett 2009 was perfect. From the Rheinhessen, the largest German wine region in both area and production, the Madonna is a blend of the grapes riesling, Müller-Thurgau, Silvaner and Kerner. The bouquet on the Valckenberg Madonna initially was tight, though it opened to a sweet, fruity bouquet. The palate was delicious ripe honeydew melon, with just a touch of acidity. The wine paired perfectly with the corned beef and cabbage, and for about $12.00 it’s a nice value. 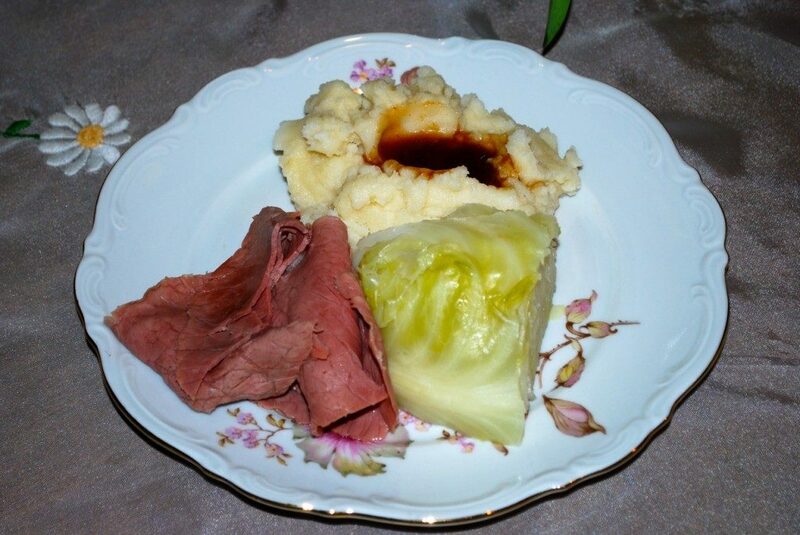 Your St Patrick’s Day party may not consist of corned beef and cabbage. Or, white wine may not be your preference, and you’d like an alternative idea for your festival. I’d highly recommend finding a recipe for Irish Lamb Stew, or a Irish Beef Stew if you prefer. And then I’d recommend pairing it with a delicious Cabernet Sauvignon. Frank Family Vineyards has a history dating back to 1884 in Napa Valley, California. They produce a wide variety of wines, from Zinfandel to a Sparkling Rouge, and their Cabernet Sauvignon. 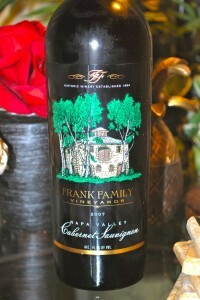 The Frank Family Napa Valley Cabernet Sauvignon 2007 is a big Napa Cab. Right out of the bottle, the nose of the Frank Family Cabernet was tart cherries with notes of spice and leather. The palate was silky, with nice fruit and firm tannins, showing the tart cherry all over the palate. After about about 30 minutes decanting, the nose is more a stewed cherry and baking spice, with blackberry and bramble notes. The palate was a full, rich red berry with warming spice. There was a green note as well, such as bell pepper, but it was a undercurrent and not a prominent taste. However, the wine really shined when it was paired with food. With each bite of the stew, the wine took on this soft, silky approach and gained complexity. The fruit was less tart, and took on a black cherry note with cocoa flavors and warm baking spice. The wine spends 24 months in french oak, about 35% new, the remainder 1 and 2 years old. The oak is well integrated, though the tannin is firm as I said. You can order the wine from the Frank Family website as well as select stores, and it comes in at $45 from the winery, though you can find it for less shopping online. If you want to skip the main course and head right to dessert, I have some great options for you. 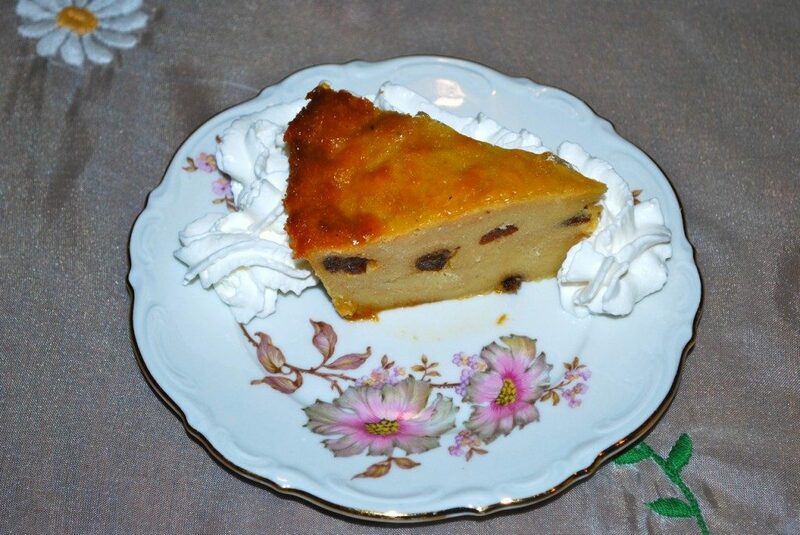 Rich and heavy, bread pudding is not only perfect St Patrick’s Day dessert, it’s delicious. It can be served hot, or cold, and with any number of toppings from whipped cream to a bourbon sauce. We served it cold, and paired it with an Italian white wine that can only be described as beautiful. 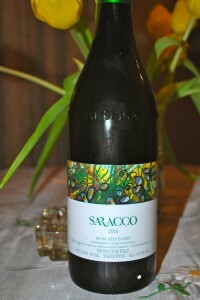 The Saracco Moscao d’Asti is an amazing wine on it’s own, and really harmonized with the bread pudding. Moscato is all the rage now, being one of the trendy wines that people ask for in restaurants, clubs, and of course, wine shops. I don’t reach for Moscato often, as many expressions are just a bit too sweet and syrupy for me. However, the Saracco Moscato d’Asti is fantastic. The wine in the glass is a beautiful light yellow hue, and you’ll immediately notice it’s slightly frizzanti, or sparkling. The nose is a wonderful white floral and peach bouquet, and it’s just gorgeous. The palate opens up with a sweet floral and apricot or peach note, and I can only describe it as delicious, refreshing, and sweet without being sugary. You can find it for around $16, and it’s worth buying! I’d serve this alone as an aperitif, or with dessert, or to sip on during a lovely evening with friends. 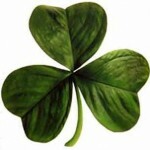 I’d love to hear how you celebrate St Patrick’s Day!